After Action Review, Post Mortem, Critique… all are terms used to describe an assessment of a project, event or activity after said project is completed. Our experience is that the After Action Review process is an important continuous improvement tool especially for major transformative activities such as the implementation of new digital technologies (software systems, user tools, etc. ), after an integration of two companies or organizations, implementation of new business process, reorganizations, etc. Organizations should want to know how well a project is performing against expectations and find out how to leverage investments for further improvements. 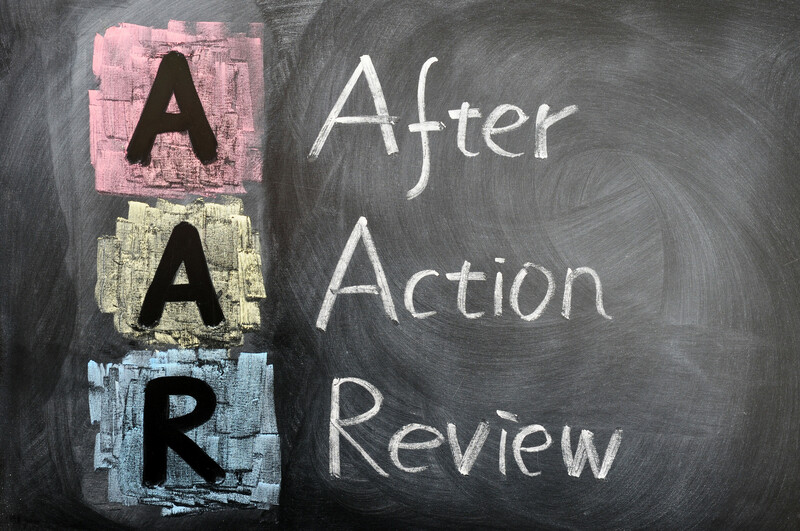 Wikipedia’s definition; An After Action Review (AAR) is a structured review or debriefing process for analyzing what happened, why it happened, and how it can be done better by the participants and those responsible for the project or event. Completing an After Action Review will begin a Team/Organization’s journey down the “ Learning Organization ” path and build their overall performance. An AAR is a simple process/tool that will facilitate this learning. It looks at the process, what actually happened, what was supposed to happen, what were the successes and what could be improved the next time. Most importantly, an effective AAR continuously asks the question – WHY? 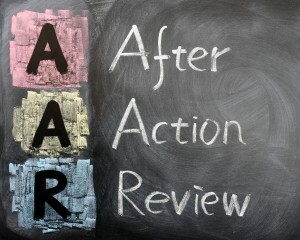 What are the Benefits of an After Action Review? Learning focused tool vs. a blame assignment. An effective AAR looks at the What, Why and How vs. Who. These must be a risk-free environment! There are many different approaches to conducting an After Action Review. Group50’s method is to keep it simple, fast and effective. We have developed a training session, an in-depth Train the Facilitator session and a simple to use template that compiles all the learnings in a ready to use format. What were the Objectives of the project/event? What was supposed to happen? What really happened? Why were there gaps? What worked really well? What could be improved next time? Why? What did we learn? What can be reapplied to the next project/event? The facilitator’s package has several more questions that will continue to draw out more information on both the project and on the Team’s dynamics. Based on Group50’s previous use of After Action Reviews, the following tips will make the process flow smoother and deliver better results. There are expanded tips contained in the facilitator’s package. One of the key benefits of utilizing an AAR approach is that the organization will grow and mature and therefore deliver projects/events faster, be on budget, exceed quality goals and deliver a higher ROI. Group50 has demonstrated that an After Action Review process will build Organization capability and capacity. If you would like to learn more about the AAR systems (Processes, Overviews, Train the Trainer Workshop and Templates) call Bruce Dougan, the head of Group50’s Organization Design and Development Practice at (513) 508-0351, drop him a line at info@group50.com or request more information here. About the author: Bruce Dougan is the head of Group50’s Organization Design and Development Practice. Bruce and the Group50 team are all former executives with well-known manufacturing and distribution companies who understand what it takes to design, train, develop and motivate organizations to successfully implement a company’s strategic plan. Group50 has designed a series of strategic assessments, workshops and strategic execution tools that optimize your organization.